Eihr.com website is not updated anymore. Amangalla is a gracious resort on Sri Lanka’s fabled south coast, housed within the colonial-era buildings of the Galle Fort. 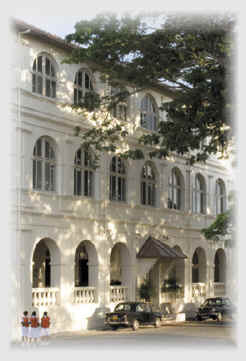 The oldest operating hotel in Asia, having first opened its doors as the New Oriental Hotel in 1863, it reflects the elegance of the colonial period dating back to the 1600s, when Dutch settlers strolled the town’s cobbled streets. Being welcomed inside Amangalla’s Great Hall, or Zaal, as it was known by the Dutch, is like stepping back in time. Its soaring fin de siècle ceilings, overhead fans and chandeliers, not to mention the veranda facing the tree-lined street, speak of days when travel was a past-time enjoyed only by a fortunate few. The hotel features many of its original furniture pieces including four-poster beds and pettagama chests. It also provides the perfect base for exploring the rich heritage of the town and the scenic countryside and picturesque villages around Galle, as well as the wildlife reserves and beaches of southwest Sri Lanka.